When you have leftover kimchi that is very fermented, you can make some yummy stew! Add some pork, tofu, rice cakes, and vegetables and you have all the ingredients for a wonderful meal. The other day, I asked people what they think if Korean food. Most people will say spicy! Korean food can be spicy. Kimchi. But only a portion if Korean food is spicy. Not all. Many people have also tried Korean BBQ or Korean beef. Very popular. 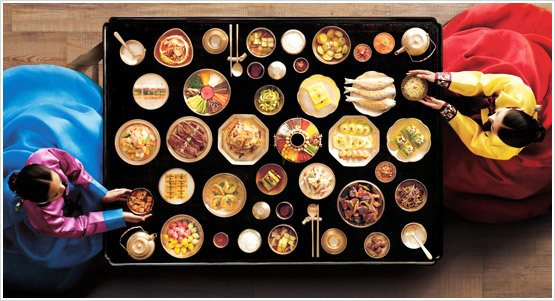 Wouldn’t it be nice if every meal in Korea was like this? I’m Joseph Chaiwhan Kim. Rice is a staple in Korea. We all eat rice. I am Joseph Chaiwhan Kim and I am Korean. I eat rice all the time. How about you? I love eating jjajangmyun. The Korean version uses black bean paste and it’s not spicy. I’ve also had this dish in China where the noodles are spicy and the sauce is not made with black bean paste. Korean kids really enjoy eating jjajangmyun. Thanks for visiting my Korean Foodie blog. My favorite place to get Korean groceries is H Mart. They used to have a different name, but it was difficult for non-Koreans to pronounce. So, a few years ago they renamed as H Mart. Good move. Do you like to cook? Are you talented? Maybe you have your own cooking show on YouTube. I had some delicious kimbap today. Nothing fancy. Simple, but yummy. Making kimbap takes a bit of work because you have to prepare all the ingredients and then roll the rice around seaweed. Kimbap is portable and easy to pack. It makes a great little afternoon snack! Koreans love to eat kimchi. But, is it healthy? Does eating kimchi cause cancer? I find myself torn because I enjoy eating kimchi. I grew up eating it. However, it appears that there are growing bodies of evidence supporting the connection between kimchi and cancer. This is particularly true for stomach cancer, a common cancer found among Korean men. I’m Dr. Joseph Chaiwhan Kim. I’m a Korean man. I eat kimchi. If I develop stomach cancer someday, I’m going to blame the kimchi!